Drifting on hypnotic waves like a buoyant starfish afflicted with doughy white appendages protruding gawkily from a too-big, spot-me-from-outer-space bright orange life vest, I peer down through clear plastic and rubber at a surprising universe. A posse of yellow fish with black stripes chases white fish with yellow stripes through a vast indigo amphitheater. Their uncouth antics disrupt the focus of a dazzling green parrot-lipped fish that until now had been grazing languorously atop the coral structure. Tiny silver bullets streak before me on a watery freeway, as if late for some important meeting. Their iridescent scales refract quivering tropical sunlight from above, creating an aura of miniature rainbows. I sweep my tunnel mask mechanically from side to side — my head becomes a reverse periscope, gathering intel on this otherworldly landscape. 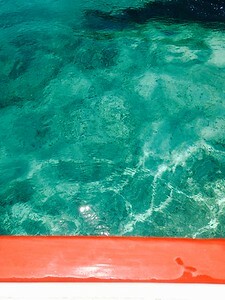 Enveloping me is the tepid turquoise of the Bali Sea. 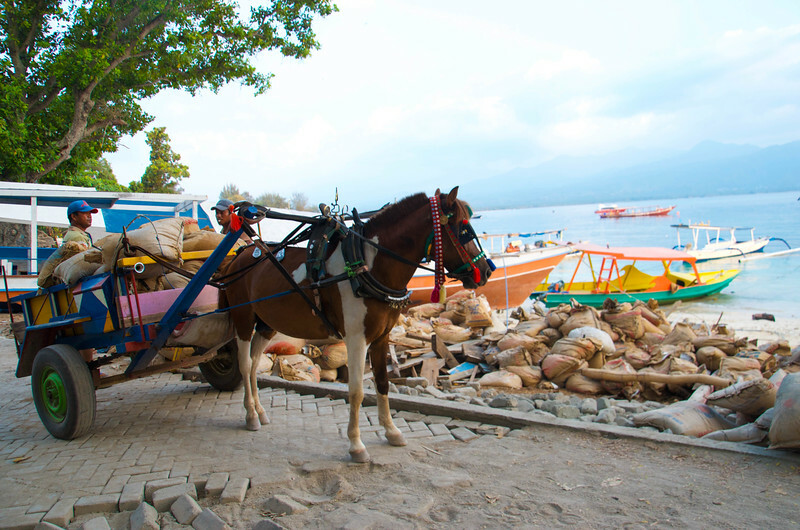 I’m bobbing somewhere between Gili Air Island (where my hotel sits, a three-minute pony cart ride from the tiny port), Gili Meno and Gili Trawangan, which form enigmatic green ellipses from above, 35 miles east of Bali. The heavenly underworld is festooned with wrinkled bronzed brain coral, brilliant-hued porous stalks, and rigid coral fans rife with Swiss cheese holes. Algae and shimmying seaweed obscure rocks and boulders while faint rays from above offer diffuse spotlights. Here and there, I spy uneasy signs of alien intrusion. Thick fraying ropes connect a forgotten anchor to nothing. A red hoodie has sunk to the sandy floor where it lies as if its owner had gone for a walk on the bottom and then been unexpectedly beamed to another dimension. 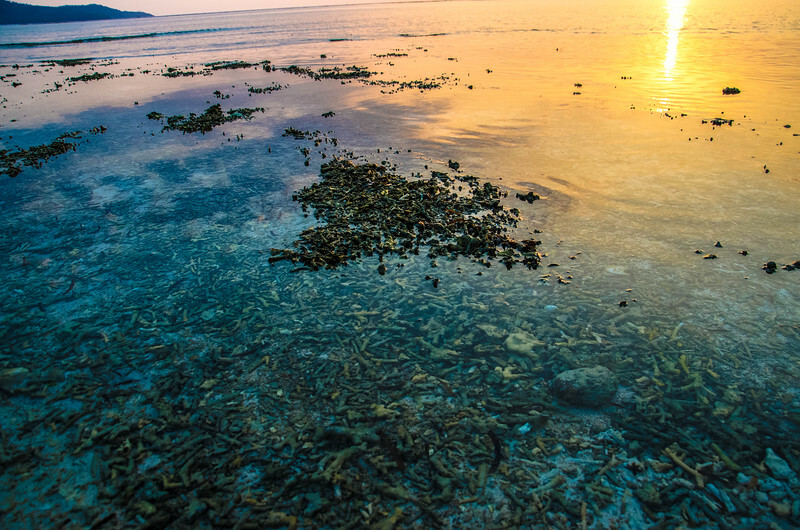 Swathes of once lovely coral fields lay gray and fragmented; now just sad pale specters. I swivel my head to the right and find my guide, the younger one with the blue swim trunks and fish hook-shaped scar under his right eye, jabbing his finger urgently toward a turbid area to our right. He’s seen something and we need to get to it fast. He tugs on my wrist, towing me floppily through the water like a dead body. 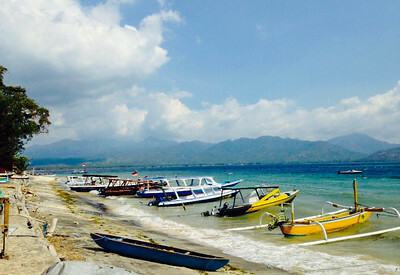 (I’d neglected to pick up fins before our tour boat left the Gili Air beach, and my bulky life vest stubbornly resists all swiftness.) I doggie paddle with my free hand and thrash my finless feet in a futile attempt at assistance. Soon we pause, hovering astronautically just beneath the surface. Blue Swim Trunks points at a space about five yards in front of us. My eyes adjust to the scene and decipher from the amorphous rocks and antler-like coral an absolutely colossal green sea turtle. I’ve never seen one in real life before. Despite its hefty shell, the seafarer glides and flaps and dances an insouciant slow-motion ballet. It flips upside down to tear mouthfuls of seaweed from shallow crevices, then flies flat across this wild-colored terrain, landing smoothly at the next salad bar. After a few minutes it ascends to the surface to sip a lungful of air. I elevate my head in time to see its golden snout poke through the mild lapping waves. Oxygen supply refilled, it dives back into its vibrant subaquatic neighborhood. I stalk it as it goes peacefully about its day for as long as I dare. I sense it must be nearly time to head back to the boat. Finally the elegant creature evaporates into the atmosphere of this strange blue dream world. I smile awkwardly around the snorkel in my mouth and turn to give Blue Swim Trunks a delighted thumbs up. He forms the “OK” sign, then jabs his thumb toward the boat while he has my attention. I begin the long, arduous doggie paddle back to earth. Next stop: The amazing insanity of India! Your writing is amazing. 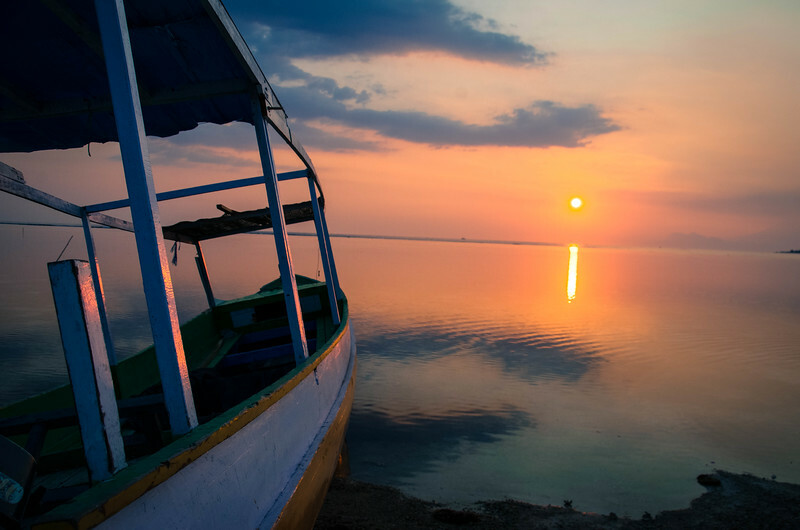 And I’m headed down to Indonesia shortly, I can’t wait! This is beautiful. I love your writing and your pictures are amazing. I’m looking forward to reading more.